Galaxies are recycling centers for gas. Dense gas collapses under gravity to form stars. When massive stars form, they quickly impact their surroundings with intense radiation and mass loss. This enriches the galaxy with heavy elements forged inside the massive stars and becomes the raw material for future star and planet formation. The evolution of the galaxy is determined by this cycle of gas to stars and back. To measure the lifecycle of gas in galaxies, astronomers use radio telescopes which are sensitive to the three main phases of gas. First, the dense gas where stars form emits light with millimeter-size wavelengths from carbon monoxide (CO). Next, gas ionized by massive stars give off radio waves when particles collide, in a process called free-free emission. Finally, heavy elements lost by massive stars, which will fuel the next generation of star formation, coalesce to form grains of dust which emit light in the submillimeter regime. With an unmatched angular resolution, the Atacama Large Millimeter/submillimeter Array (ALMA) is the tool of choice for studying the cycle of gas in galaxies. 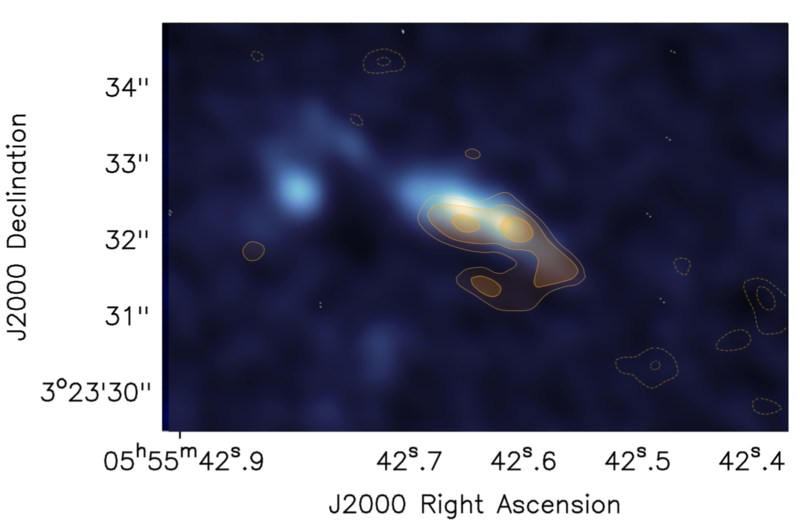 The authors of today’s paper used ALMA to measure the gas and dust in the nearby galaxy II Zw 40. This small galaxy is forming stars at a prodigious rate. The starlight in the galaxy is dominated by massive stars. The authors investigate the effect of these stars on the gas and dust in the galaxy. With ALMA, the authors observed three different components of II Zw 40. At a wavelength of 3 mm, the dominant source is free-free emission from ionized gas around the massive star cluster. At 870 µm, after accounting for free-free emission, most of the light is emitted by dust grains. These two components are shown in Figure 1. The peaks of ionized and dust emission are distinct, and the dust emission is localized in several clumps around the cluster. Figure 2 shows the dense gas compared to dust emission in II Zw 40. Dense gas is traced by emission from CO molecules. The CO emission is offset from dust emission, with areas of dense gas devoid of dust and vice versa. The authors convert the intensity of CO emission to gas mass using the so-called ‘X-factor’. Dividing the mass in gas and dust, the authors find that the gas-to-dust ratio varies from ~ 70 to 270 across the galaxy. Not only does the ratio vary, but it’s also low overall – there is more dust per unit gas than the authors expect for a galaxy of this type. 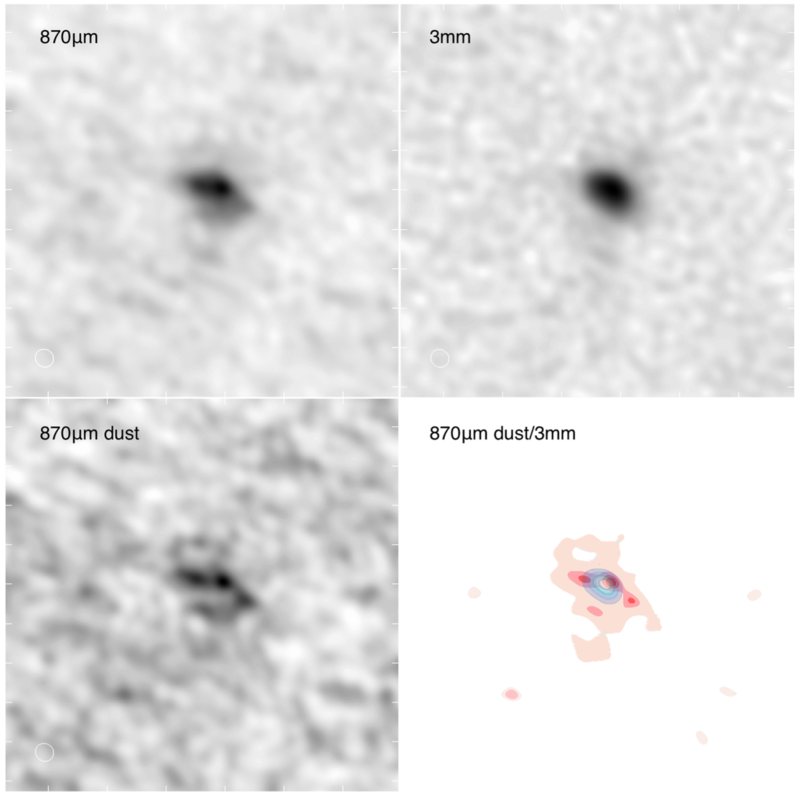 To explain the low, variable gas-to-dust ratio and the clumpy structure of the dust emission, the authors propose that massive stars enrich nearby clouds with heavy elements and dust. Because this enrichment is ongoing, more dust is joining the dense gas. This lowers the total gas-to-dust ratio. The dust is clumpy because it has not yet mixed with the rest of the galaxy. This enrichment model suggests that dust without associated dense gas came from an older star cluster. This cluster is not visible in free-free emission (Figure 1) because it no longer ionizes gas. Take another look at Figure 1. Notice how the peaks of dust emission are all slightly offset from the peak of the ionized gas. In addition to ionizing gas, the intense radiation from massive stars can actually push on dust grains. Acting like a multitude of tiny billiard balls, the photons from bright stars exert radiation pressure on the dust. The dust drifts relative to the gas and may explain the offset between gas and dust peaks. 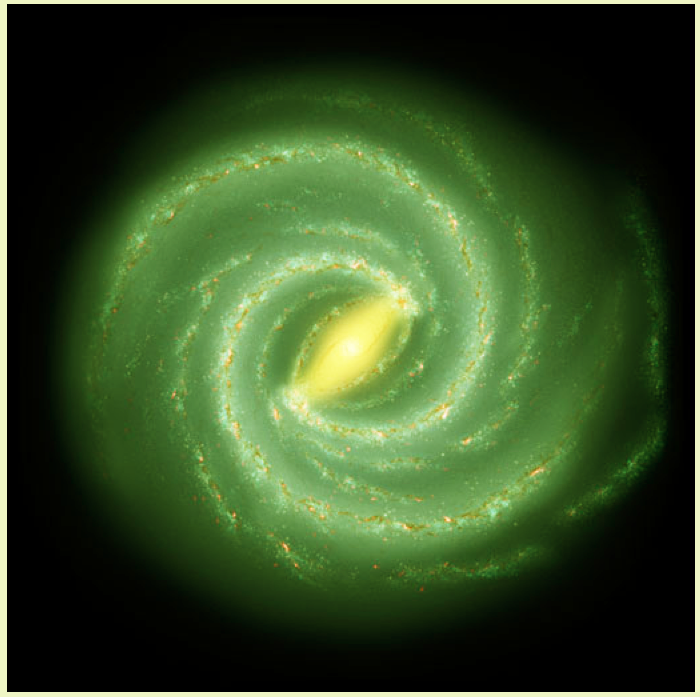 ALMA has revolutionized the study of star formation in galaxies. This paper shows that the cycle from dense gas (traced by CO) to massive stars (3 mm) to dust-rich gas (870 µm) is complex. The massive stars in the galaxy have enriched parts of the galaxy, while other areas remain relatively dust-free. The dust-rich products of stellar evolution are pushed by radiation pressure but have not yet mixed into the galaxy. Future studies of the galactic recycling plant will explain the origin and dispersal of the ingredients needed for planets and (perhaps) life. Cue Carl Sagan.